Metronomic maestro Xavi, who initiated proceedings just over an hour-and-a-half prior, walked towards the touchline to receive a rapturous reception from the stands, before being replaced by Malian international Seydou Kéita. Hot on his heels was the man who had continued the festivities shortly after the first blow to the eternal enemy had been struck: Number 17, the 23-year-old already simply known as Pedro, who had become a regular fixture on the Blaugrana flanks during the preceding victorious campaign. Taking his place was another product of the envy-inducing La Masia academy also affectionately known, as is common in Spanish-speaking football cultures, by just his forename. Bearing the number 11 shirt formerly worn in his first few seasons at the club by Brazilian magician Rivaldo, 22-year-old Jeffrén (Suárez) had at this point barely made a handful of official appearances for the first team. Venezuelan-born but raised in the Canary Islands since the age of one, he was nevertheless a familiar face to much of the faithful due in part to his feats at youth and reserve level and enthusiastically ran on to experience his brief share of this memorable triumph. Little did he know just how much he would soon be contributing to both local folklore as well as his own personal myth. Just four minutes later the game had entered stoppage-time and the ball was suddenly nudged by Andrés Iniesta forward on the right to another home-grown star-in-waiting also more commonly known by his first name. Bojan ran into space towards the edge of the area and crossed in a low ball that narrowly evaded the stretch of the incoming 2010 World Cup final goalscorer. However, having already sensed a potential opportunity, dashing in from his designated left side of the field was Jeffrén, instantly reaching what Iniesta could not and beating Iker Casillas at his near post. If the person in charge of the electronic scoreboard was neglecting their duties in the immediate aftermath it would have been understandable, for when they came to their senses it was to read: Barcelona 5-0 Real Madrid. Jeffrén rapidly reeled away and immediately darted over to Pep Guardiola and the Barcelona bench where he was mobbed by Lionel Messi, Sergio Busquets and all the other men absorbed in the methods that had made this the greatest team of the 21st century. When Gerard Piqué detached himself from the throng, he raised five fingers to the crowd who needed no encouragement in obliging with similar gleeful celebrations of their own. When the final whistle was blown a couple of minutes later, it is unlikely that Sergio Ramos’ dismissal and subsequent petulant assaults on his La Roja team-mates Carles Puyol and Xavi immediately after the goal celebrations had fully registered with Jeffrén. He was on cloud nine and had every reason to believe that the good days would keep on coming. Indeed, in 2006, he had featured regularly in Spain’s victorious Under-19 European Championship side. He played in Poland alongside the likes of Juan Mata, Mario Suárez, Gerard Piqué, Javi García, Antonio Barragán, Gorka Elustondo and Esteban Granero, chipping in with the first goal that got the ball rolling in a 5-0 semi-final thrashing against Austria. He also came on as a substitute in the final in Poznań a few days later, helping to see out a 2-1 win over Scotland, courtesy of two goals by recent Porto signing Alberto Bueno. Thus, while in 2010/11 there was congestion in the attacking berths from, most notably, Messi, Pedro, Bojan and David Villa, Jeffrén nevertheless possessed the pedigree to strongly suggest that he was capable of remaining at a respectable top-flight level for some time yet. He was to play eight league games in total that season and went some way to further cement his credentials when he once again represented the country that had reared him at the 2011 Under-21 European Championships held in Denmark. Born on 20 January 1988, had the then 23-year-old been born just 20 days earlier, he would not have have been eligible to participate, which is just as well for Spain as it could be argued that their eventual triumph never would have occurred without one of his contributions. Indeed, with Jeffrén having come on to replace Athletic Bilbao’s Iker Muniain with 20 minutes remaining, La Rojita were trailing Belarus 1-0 in the semi-final and this was still the score with little more than a single regulation minute left on the clock. However, following some characteristically patient and pinpoint passing play involving, amongst others, Mata, Bojan and Thiago Alcântara, Jeffrén received the ball on the right and, stretching, instantly played in a low cross that the alert Adrián reached first to knock into the back of the net. 1-1 and another much-fancied generation of Spaniards were suddenly back on track. Extra-time therefore followed, during which the same striker (who would soon after transfer to Atlético Madrid and has since recently moved on loan to Villarreal from Porto), headed his side in front with his second of the game in the 105th minute. Just under ten minutes later, Jeffrén was once again on hand to provide the icing on the cake, cutting onto his left foot and rifling in a sensational left-footed golazo from over 20 yards. 3-1, game over. Three says later, the side also containing David de Gea, Ander Herrera, Javi Martínez and César Azpilicueta thus marched into the final in Aarhus, where they defeated Switzerland 2-0, with Jeffrén appearing as a late substitute. So, maybe sometimes a bridesmaid rather than the bride, but a rather attractive one all the same. In search of regular first-team minutes, he was to depart from Catalonia just over a month later for Portuguese giants Sporting, though a testament to how highly Guardiola and his colleagues still thought of him was the buy-back clause they ensured was inserted into his contract as part of the deal. However, despite evidently still being thought of as a potential high-level talent, his time in Lisbon was to be a huge disappointment to all, as he struggled with injuries, form and, ultimately, starting opportunities. He played in fewer than 25 league games in his two-and-a-half years there, before moving back to La Liga with Real Valladolid in February 2014. Here, the misery was to continue as a few months later the team was relegated. Subsequently, despite playing the closest he ever has to a full season, as only 19 of his 35 second-tier league appearances for 2014/15 were as a starter (of which he was substituted 12 times) and his combined number of goals and assists could be counted on one mano, this could hardly be considered a year of rejuvenation. Thus, following their failure to regain their top-flight status after they were eliminated in the play-off semi-finals, Valladolid released Jeffrén. In the past month or so, while old rumours of a move to the English Premier League were no longer doing the rounds, there had been some speculation that he may return to the Canary Islands to join Tenerife, the side at which he had a brief association as a teenager. A far cry from where ex-colleagues Pedro and Bojan currently reside but perhaps the kind of morale boost he needs. Instead, in the past week, in what on the surface at least may appear to inaugurate the latest chapter of his downward spiral, he has signed a three-year contract with Belgian second-tier club KAS Eupen. Or is it? Eupen only narrowly missed out on promotion last season and, as of 4 September 2015, currently top their league. Moreover, a certain Christian Santos finished a two-year spell at the club a couple of seasons ago, during which he regularly found himself on the scoresheet and, excluding the injury-plagued year that followed, has since seen his career flourish. Last season, for someone often fielded on the flank he was banging in the goals at a heroic rate (23 in 34 league games), helping NEC Nijmegen steamroll their way into the Dutch top-flight. It is not yet known as to whether Jeffrén sought Santos’ advice, but given the parallels in the lives of these two men, it is certainly possible. Thus, the dual adventures that the ex-Barça man is about to embark on could well prove beneficial to providing the incentives to get him back on track. A trawl through social media sites and the Venezuelan press reveals that there are plenty currently unwilling to forgive him for these comments and the issue has certainly sparked some debate in the days leading up to his likely debut. It has, after all, only been in the last two years or so that he has publicly expressed more openness to switching allegiances. As this has coincided with his club career sliding downhill and his chances of representing La Roja evaporating, most Venezuelans do not kid themselves that they are anything but his international back-up option. However, albeit with less public rejection to apply selective amnesia to, the national side’s devotees have most certainly been in similar situations before. Most famously, it was only four years ago that defender Fernando Amorebieta – Venezuela-born but to Basque parents – gave up on his ambitions to represent Spain, having previously been part of the Under-19 European Championship-winning side of 2004 and, latterly, even receiving a call-up to Vicente Del Bosque’s senior squad for a 2008 friendly. He made his Vinotinto debut in 2011 and went a significant way to emerging victorious in the PR battle with the belligerents in October of that year by scoring the history-making winner against Argentina – Venezuela’s first-ever competitive win against their illustrious opponents. These are just two examples of many, as complex identities are nothing new for Venezuelans to have to contend with when cheering on their representatives. Indeed, in a country where baseball has traditionally held the greatest sway over the affections of sports fans, football has instead often received much innovation and development from those with what some may perceive as divided loyalities. Many of the domestic clubs were originally formed by immigrant communities, from whom plenty of the nation’s leading players have also been derived, most famously Juan Arango, the Venezuela-born son of a Colombian couple. Thus, though Jeffrén carries with him some additional self-inflicted baggage, he can take some heart from the experiences of many of his forebears. If, as seems likely, he makes it onto the field against Honduras and/or Panama for his debut, should there be any vocal hostility, he can cling to the belief that so long as he gives his all, his hard work should ultimately be appreciated. That said, a goal in a big game wouldn’t hurt either. Alas, as this site’s detailed preview relates, his new international side is not short of pacy wide men, so one can not be confident of his future after these two games are over. Despite having a disproportionate number of potential providers to call upon to both assist and take some of the burden off lead man Salomón Rondón, the attackers have nevertheless struggled to combine and gel effectively. Collectively, since manager Noel Sanvicente’s arrival in July 2014, Venezuela have scored a mere 14 goals (12 officially) in 11 games. Work amongst those in the two front lines evidently needs to improve. Given that Sanvicente himself concedes that Jeffrén is not currently in the best of form, there is certainly some scepticism as to whether the player can come out of the blue to force his way into the coach’s burgundy plans. Nevertheless, the Masia graduate’s international debut is something that many have been anticipating for years; so much so that, irrespective of the outcome of this experiment, it almost feels necessary for it to occur. Will it be the end to a protracted saga? Or perhaps the launchpad for a bright new phase in what could well be the peak years of his career? Only time will tell. Expected to appear against at least one of the upcoming Central Americans opponents at the Estadio Cachamay in Puerto Ordaz, the boy whose family uprooted from nearby San Félix 26 years ago may feel less out-of-place than some anticipate. Indeed, in the build-up to his Vinotinto bow, he has spoken of his excitement at playing in the state where relatives of his still live. Aptly poetic or false sentimentality? With Venezuela’s latest bid to finally qualify for a World Cup starting next month, one suspects that for his detractors, his on-field actions will speak considerably louder than any of his words. Article originally published on 4 September 2015. *Author’s Indulgence: Over a decade ago at his English secondary school, your faithful Venezuelan football enthusiast regularly sat in German lessons next to a boy who is largely remembered for having once asked the teacher who had summoned him to the desk, if she was “‘avin’ a giraffe’. Somehow this Mockney qualified to represent Scotland and played in the final of the 2006 Under-19 European Championships, where he came up against none other than Venezuelan newboy Jeffrén – then, of course, wearing the colours of the victorious Spain. As noted in the article, the then-Barcelona man would later go on to help La Rojita lift 2011’s Under-21 European Championship trophy while his new compatriot Frank Feltscher – then donning the tracksuit of Switzerland – watched on with his defeated team-mates from the sidelines. Identities, eh…? UPDATE: Jeffrén did not feature against Honduras (4 September 2015). As Venezuela slipped behind in the second half and ultimately lost 3-0, it was probably for the best that he was not introduced at any point on what was a fairly dismal evening. That said, the sparse crowd that did attend nevertheless maintained fairly good spirits until the final whistle so if, as is predicted, he makes it onto the pitch against Panama on Tuesday, it seems like he can expect a good reception in the state where he was born. 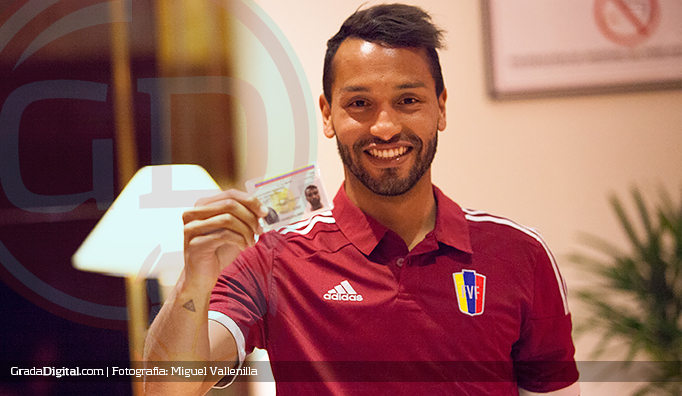 UPDATE 2: As Juan Arango made what he later announced to be his last ever Venezuela appearance, Jeffrén made his debut. One out, one in, some might say. He played the final 30 minutes in the rather dismal 1-1 draw against Panama. Click here to read about how he got on. This entry was posted in Spain, Venezuela National Team, Venezuelans Abroad and tagged Barcelona, Camp Nou, El Clásico, European Youth Football, Honduras, Jeffrén, Jeffrén Suárez, KAS Eupen, La Masia, La Vinotinto, Latin American Football, Manita, Panama, Real Madrid, Real Valladolid, Sid Lowe, South American football, Tenerife, Venezuela, Vinotinto, Whatever Happened to on September 6, 2015 by hispanospherical.